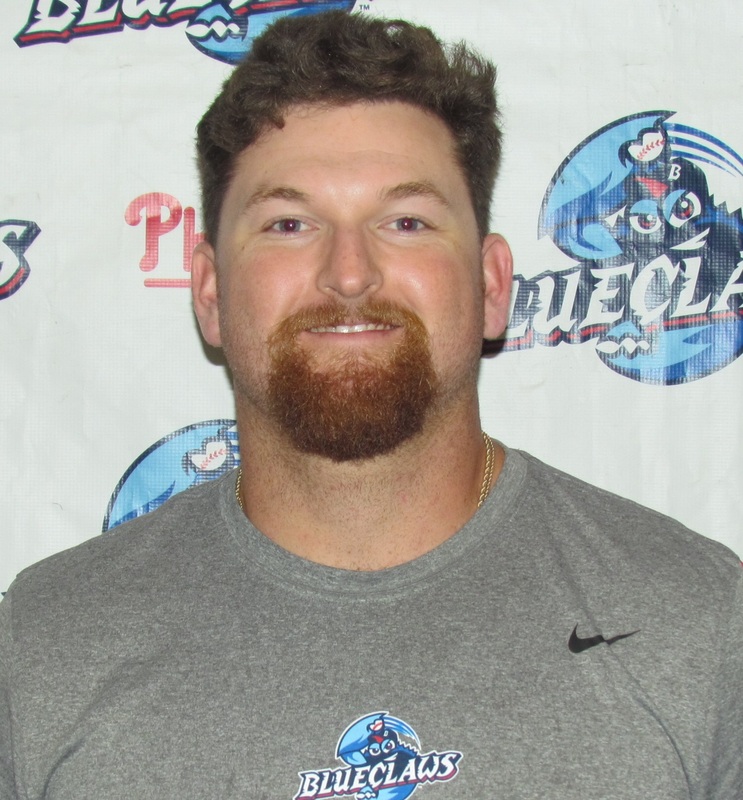 Lakewood first baseman Quincy Nieporte admittedly hasn't posted the greatest offensive numbers to date this season, but the 23-year-old first baseman is on his way to improving and is helping the Class A BlueClaws fight for a division title in the South Atlantic League. Nieporte, a righty batter, was the Phillies' 26th round draft selection last year out of Florida State University. Listed at six-feet-one and 225 pounds, Nieporte made his pro debut last year with the rookie level Gulf Coast League Phillies, where he tallied a .299 average with five home runs and 35 RBI in 41 games. This year, through 40 games with Lakewood, Nieporte has notched a .224 batting average with three homers and 13 RBI. Recently, I talked with Quincy about welcoming the challenge in Class A, his team's overall success, which Phillies player he learned from and more. Read ahead for the full interview. -What are your impressions of the league so far? Is the Sally League tougher than you expected? Definitely a lot more consistent talent. I spent half the year last year in the ACC in college and then the other half of the year was in rookie ball in the GCL and I just think the biggest (difference) was the consistency that you see every day and the schedule and everything. But everybody can play in this league and pitchers are gonna pitch with velocity and some good stuff. So, I've been impressed. I've been under-impressed with myself so far, but it's just an adjustment period. It's a long season. It's not a sprint. It's definitely a marathon. But, I've had some fun here. I've made some relationships and started to see how most organizations play as a whole and it's pretty fun. It's a fun journey. -You mentioned being a little let down. What's the focus for you right now? What are you working on? Right now, the past few days, me and (hitting coach Tyler) Henson have been focusing on simplicity. Keeping my swing as simple as possible, so I can think as minimal as possible in the box. It's been going well. I'm confident with the direction we're going in and the steps we've taken so far. It's one of the those things that's just going to kind of keep going and you've got to get comfort and muscle memory and every day I'm gonna be a little more comfortable in the box. I've had a couple swing changes to start the year already. I think this is number three of four, which is fine. I'm a guy that likes to make the adjustments and I've always been told throughout a minor league and major league season, you're always kind of tinkering with stuff, so I know there's going to be changes. I'm not too upset or anything. I'm excited and embracing the challenge. -When I've seen you on the field and near the dugout before a game, you're one of the most excited guys I see out there. You're smiling, clearly enjoying yourself. With that talk about keeping a positive attitude, that doesn't surprise me based just what I've seen of you. So, you find it easy (to keep that outlook)? -I love that outlook. I wanted to ask you about just coming to this organization, without much exposure to the Phillies before you signed here. What were your impressions of the organization? Before joining the organization, they were always the team that beat my team. I was a Braves fan, so growing up through middle school and high school, I was always a Braves fan. It seemed like every year the Braves or the Falcons would let us down in Atlanta and it seemed like it was from the Phillies or Chase Utley and Ryan Howard, so I knew a lot about the Phillies beforehand. So, it was just one of those things when I got the call that I was going to be a Phillie, I was happy. It's a new home and I loved it. -Any difficulty with that, though? I imagine if you're growing up as a Braves fan, your family and friends would be Braves fans too. It's funny. We moved a lot growing up, so we were from South Florida, then Atlanta, then New York. For some reason everyone in my family loved the New York teams. But I could not stand New York. I loved the Braves and the Falcons even when we were from South Florida. So, it was an odd fan group I got into. I was all alone. None of my family shared the same views, so I was kind of rooting on these teams quietly in the living room by myself. It was different. It was one of those things that I didn't have a strong connection with, so it wasn't like I just got drafted by my absolute arch nemesis team. I was just happy. I knew, come draft, whoever picked me was gonna be my new favorite team. It was an easy decision. -How about with the New York teams. That's kind of a regional rivalry. Were you able to convert and of the family members over to the Phillies' side? Yeah, my mom, brother and my sister, they'll pretty much support me where ever I go, whatever I do. I think in the back of their mind, they wish I would get traded to the Yankees. But, I think they're big Phillies fans right now. -That's good. How about this team? What would you cite as what's helped the BlueClaws compete and do pretty well so far this season after a slow start? Honestly, the pitching staff has been unbelievable to start the year. If you ask anybody, any position player right now, I think we'll all agree that the offense hasn't been that great. I think once the offense starts clicking and the pitching keeps doing what they're doing, I think we're going to be a pretty competitive team. I think this team is full of guys that get after it and know how to play. Kind of just dogs, you know what I mean? We're not going to quit. We've had one game this whole year we've been blown out and we came back and won the series. I think it just goes to show you what this team is made of and we've got a lot of experience with college guys, some of the high school guys have been in the Phillies organization for a couple years, so I think everyone has the same outlook on the sport of baseball and you got to do what it takes to be a successful team and right now one of the-- well we've got two major aspects and it's defense and pitching. And obviously the base running will come when the hitting comes, 'cause obviously you need the hitting to get on base. We're doing two out of the four very successfully and for us to be where we're at statistics and standings wise is pretty impressive and speaks volumes for everybody on the team. -Is there anybody in the organization that you've picked up a lot from? Honestly, everybody. Not only the big league guys that come down that you get to watch every now and again, and the coaching staff, and everybody coming in and out of Clearwater and up here so far. All the players. Guys that are younger than me, older than me. I kind of just watch everybody's mannerisms and see how they go about it. Some good, some bad and you see that some guys' mannerisms are worse than others and they go about things a little negatively. So, obviously there's a little learning curve, but I think the coolest moment that stuck out to me was the day before we flew up to start our season, we got Tommy Hunter and Jake Arrieta threw a simulated game to us and after he threw to us, Arrieta was talking to our pitching coach, Bergy (Brian Bergeson), and just kind of listening to how he broke down his feel and what he needs to feel in order for him to know if he's going to be successful or going to have a good game. It was just amazing the details he went into. So it was kind of one of those glimpses of listening to a guy of that caliber and just hearing how he looks at the game and how calm he was about it, but not freaking out or anything or stressing anything too much. It was cool. I wasn't even in the conversation. I was just eaves dropping and loved it! -Did you get to step in against him at all? Not against Arrieta, unfortunately. No, I was excited and looking forward to it, but the way we had the guys pitching and he was on a pitch count, I was playing first. It was cool being at first and seeing him on the mound. It was kind of a surreal moment. So, it was fun. -We're standing beside a wall here, leading to the club house and it's got pictures of everyone that's gone "from the shore to the show", as they say. Guys that were BlueClaws and made it to the big leagues. Have you glanced over this at all? I noticed immediately when we first got back from the road trip, it was new. The biggest thing that was interesting to me was seeing all the names, that I didn't even know came up with the Phillies organization. Guys that you see in the big leagues with other teams. It's impressive. It's crazy. And it's something that motivates everyone in here. They're walking out the door to go play and they kind of take a glimpse and even if they don't look at it every time, they know there's 50 or so pictures up here. So, it's a helpful reminder to keep in the back of your mind that maybe one day you could be the next picture. Is it time to be concerned about Mickey Moniak?